Update 2010-08-06: It looks like the sfDoctrineActAsTaggablePlugin team has incorporated much of this into the version they released today. I’ll post more when I get a chance to try it out. Another goal was to use JQuery UI with the nice visual theme I built with their Theme Roller tool (which I had already installed and added to my symfony project). enable the plugin in config/ProjectConfiguration.class.php. Rebuild your model and forms and everything. My favorite way is to dump the old data to fixtures, then rebuild everything. At this point you should have new database tables tag and tagging, and the proper model relations and everything. a hidden field for storing tags to be removed after clicking on the delete icons. add the tag field(s) to the configure() method of your form, in lib/form/doctrine/ModelForm.class.php. // much of this I copied and adapted from a cached admin generator template. Yay! 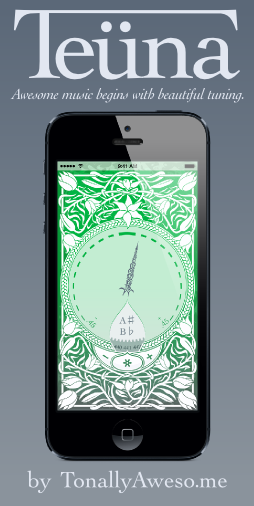 Now I can add, display, and remove tags. Now for the fancy parts. As detailed in the README, sfDoctrineActAsTaggablePlugin has typeahead support. I tried it, but I didn’t feel like the user interaction was quite smooth enough, and I wanted to use the excellent, beautiful, and user-expectation-meeting jQuery UI Autocomplete widget. I ended up using the action provided by sfDoctrineActAsTaggablePlugin, but modified the view to return JSON instead of an HTML <ul>, and I used the multiple, remote demo code from the jQuery UI Autocomplete documentation. 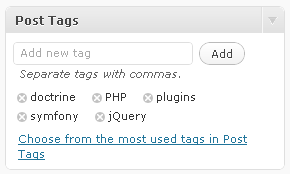 I like how WordPress has an option for picking tags from a tag cloud too. The sfDoctrineActAsTaggablePlugin made this nice and easy. // The %s in the second arg will be substituted with the tag text. I made lots of incremental changes to my CSS but here are all of the sections relevant to the tag stuff I’ve shown here, I think. Yay! I’m pretty happy with it so far. I hacked at it for a couple days though and have been cloudy with fighting a cold, so if I’ve missed anything let me know. I think this is enough to get me there more quickly the next time. One thing I have noticed with model’s that are created via behaviors is that I ran into issues when trying to create an admin generator module for them. Did you create a custom module to maintain the tags (I would like a way to add new tags manually as well as rename and merge tags). I haven’t made a module for editing tags yet. Tags get automatically added when users type a tag that doesn’t exist yet, so that’s not necessary. Unused tags will get cleaned up by the “taggable:clean” task. That lets me add, edit (rename) or delete tags right out of the box without messing with the taggable models. Adding a merge feature would just require a custom action, I think; the admin generator isn’t going to do that sort of complexity for you. In my project we have tags that are actually more like “phrases” would be nice to have the option if you want to only split on comma or spaces ..
Plus I would like some way to actively discourage creation of new tags. Maybe require users to conform if they are adding a tag that doesn’t exist yet. The way these work right now, it only splits on commas, so it allows multi-word tags that include spaces. I think that’s what you mean, right? I haven’t had a chance to try it yet, but it looks like the sfDoctrineActAsTaggablePlugin team has incorporated most of this into their release today. Yay! I have the issues with this tutorial. I can’t post my form beacause all I got is validation which is always false. I dug the internet and my project and can’t find where is the bug. Any suggestions? Doublecheck your $this->setValidator ... required=>false lines from the lib/form/doctrine/ModelForm.class.php code sample above? Hi, I’ve a form with city field autocompleted using sfFormExtraPlugin. I followed your post, and I can’ t handle tag autocompletion. This problem is actually not related to your post or sfDoctrineActAsTaggablePlugin. Code generated by widget sfWidgetFormDoctrineJQueryAutocompleter from sfFormExtraPlugin, blocks somehow jquery UI autocomplete behavior. Have you encountered this problem? Can you prompt me possible solution? Thenks for your post, it helps me a lot. Below is code generated by sfWidgetFormDoctrineJQueryAutocompleter. sfFormExtraPlugin actually uses a very old autocompleter jQuery plugin, not the more modern and documented jQueryUI one. For one thing, it expects a totally different format from the JSON action. Just last week I tore out sfFormExtraPlugin’s autocompleter on a Symfony project in favor of the jQueryUI one, which I think is demonstrated here. Don’t get confused by sfFormExtraPlugin’s autocompleter! Oh man… Thanks a lot. I perfectly embedded your tag system in my project and works like a charm.